Provide the best service a the lowest possible cost. Create competitiveness through the highest levels of professionalism on a company wide basis using quality management and service to obtain the best possible results. Promote the sustainable development of our society. All the above mentioned factors in addition to the superior level of qualification of our professionals in this area, we believe gives are clients guaranteed quality service, creating efficient collaboration, business to business and at an industry wide level. Equally important is our concern for the environment that surrounds us. Our objective is to minimize the impact that our commercial activity has on the surrounding area, this goal is a constant factor in policy and decision making processes. Based on the foundation of our business strategies, we have established a quality and environmental control system, in compliance with the following regulations: UNE-EN ISO 9001 e UNE-EN ISO 14001. A- Identify the processes that are necessary in the quality management system, and insure their implantation throughout the organisation. C- Determine the most adequate criteria and methods to insure that operation and the monitoring of these processes is efficient. D- Insure the availability of resources and information to support the function and control of these processes. F- Implementation of actions that insure goal achievement, and continuous process improvement. A- Their adequacy in the context of the organization’s aims. B- The inclusion of the obligation to comply with the requirements of the quality system and to continuously improve its efficiency. C- Provide a framework that acts as a reference for establishing and revising. D- Be communicated and understood by the company via the hierarchy , Quality Manager, other heads of departments, each and every member of all the respective departments. E- Constant revision to allow their adaptation and publication to all the interested parties. F- The inclusion of a commitment to prevent environmental contamination. The quality and environmental policies are communicated to all our employees and all those who work in our name. Quality assurance, according to the international quality system ISO 9001. Consoldating customer confidence, by meeting the requirements set by them. Meeting the standard set by current legislation that affects the company’s activity. Efective management and control of the services that the company offers. 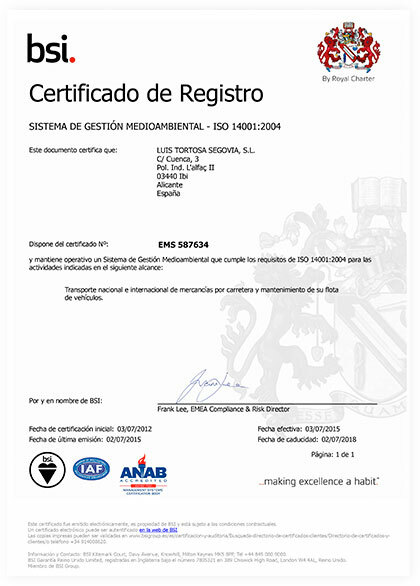 Continuos improvement of processes, proceedures and services. Create awareness and motivation amoung the employees, of the importance of implanting, development and mantainance of the quality system. Setting of measuable objectivies, and the monitoring of these, in order de guarantee the continuos improvement of our organisation. The quality control manager will be responsible for guaranteeing that each and every person, at all the levels of the organization, that intervenes in the quality and environmental control processes is familiar with and understands the objectives and polices that make up the system. The board of director of the company is aware of how important the environment is. They are conscious of the fact that the companies activities ( transport and float maintenance) can potentially alter the surrounding environment. For this reason they are committed to behaving in a responsible an adequate manner. Our environmental policy requires that all of our waste production, tipping and emissions be completely controlled and that where ever possible , all the material associated with our commercial activity should be recycled. This policy has set us on route to act in a way that leaves the smallest possible impact on the environment. Protect our immediate and wider environments through procedures that are aimed at preventing the possible contamination that our commercial activity could produce. Complete compliance with the current legal requirements. Centre our work on management processes that insure continuous improvement on a daily basis and in our relations with third parties. The maintenance of out fleet of vehicles. The adequate maintenance of our premises. Recycling of our residues and waste. The dedication of resources for training and awareness in environmental issues and the constant promotion of these issues amongst our clients and suppliers. The publication of our environmental policy in order to facilitate is diffusion and evaluation. To insure the acceptance of this environmental policy, it is based on the requirements of the UNE EN ISO 14001 ENVIRONMENAL SYSTEM MANAAGEMENT. These requirements are applied to all of our activities and our fleet of vehicles based in our installations in Ibi (Alicante).